Chapter Six: Disparities in Cervical Cancer Incidence and Mortality: Can Epigenetics Contribute to Eliminating Disparities? Cancer Disparities, the latest in the Advances in Cancer Research series, provides invaluable information on the exciting and fast-moving field of cancer research. 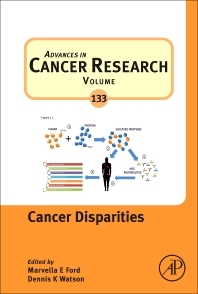 This latest volume presents a broad introduction to a spectrum of factors contributing to cancer disparities that include ancestral informative markers’ role in properly identifying race based on genetic ancestry, basic biological pathways contributing to cancer disparities, epidemiological factors linked to cancer disparities, and social/behavioral factors influencing cancer disparities. Dr. Marvella E. Ford is a tenured Professor in the Department of Public Health Sciences at the Medical University of South Carolina (MUSC), where she is the Associate Director of Cancer Disparities at the National Institutes of Health/National Cancer Institute (NIH/NCI)-designated Hollings Cancer Center. She completed her undergraduate training at Cornell University and she completed her graduate and postdoctoral fellowship training at the University of Michigan. Dr. Ford has led several federally funded cancer disparities-focused research grants, including an NIH/NCI P20 grant, in collaboration with Dr. Judith Salley from South Carolina State University, titled South Carolina Cancer Disparities Research Center (SC CaDRe). The goal of the SC CaDRe was to expand cancer disparities research in South Carolina while cultivating a diverse network of cancer researchers. The grant provided funding for cancer disparities research and also supported cancer research training for underrepresented students and junior faculty in cancer research methods. Additionally, Dr. Ford has collaborated as a multiple principal investigator, with Dr. Chanita Hughes-Halbert and Dr. Carolyn Britten, on an NIH/NCI-funded Minority Based Community Oncology Research Program to increase the participation of diverse participants in cancer research. Dr. Ford has also served as a multiple principal investigator, with Dr. Nestor Esnaola, of an NIH/National Institute on Minority Health and Health Disparities grant titled “Improving Resection Rates among African Americans with NSCLC.” The purpose of the study was to evaluate a strategy to improve rates of receipt of surgery among African Americans with early-stage lung cancer. Dr. Ford has also led several federally funded cancer research training programs in collaboration with three historically black colleges/universities (HBCUs) in South Carolina: Claflin University, South Carolina State University, and Voorhees College, as well as the University of South Carolina. The programs have been funded by the NIH/NCI and by the Department of Defense. Dr. Ford is the author/co-author of more than 85 published scientific papers, several of which include undergraduates from HBCUs as co-authors. She has also published nine book chapters. Dr. Dennis K. Watson has long standing interest and expertise in the areas of cellular and molecular biology, gene discovery, cellular differentiation and molecular oncology. During the initial stages of oncogene discovery, he was among the first to molecularly characterize the viral and cellular myc genes. He was also among the discoverers of the Ets gene family and has been directly responsible for the isolation and characterization of Ets gene products and their role in cellular proliferation, differentiation and etiology of cancer. In addition to continuing to evaluate the role of specific Ets genes in cellular transformation, his laboratory has identified and functionally characterized genes with altered expression during cancer progression. His research program has expertise in using in vitro and in vivo loss of function and gain of function approaches and molecular analyses to examine the functional significance of altered expression and the regulatory networks that such changes control. Recent studies in Dr. Watson’s laboratory have explored the role of regulatory circuitry in tumor cell interaction with the microenvironment. Dr. Watson has an extensive track record in educating and providing mentorship to over 25 predoctoral students, 25 postdoctoral trainees, and 12 junior faculty. He has also been a member of the thesis committees for 56 other graduate students and is the leader of the MUSC College of Graduate Studies’ Cancer Biology curriculum for predoctoral students. After more than a decade as research program leader for the MUSC-HCC Cancer Genes and Molecular Regulation Program, he was appointed the inaugural Associate Director for Education and Training in 2013. In this role, he chairs the career development committee of the MUSC-HCC K12 program, and works with MUSC-HCC leadership to develop education and training initiatives.